Hey college football fans, if you want plenty of college football content on the go from the Worldwide Leader, check out ESPN’s College Football app for the iPhone, iPad, and Android. The ESPN College Football app is essentially a rebranded version of last season’s “Bowl Bound” app. The ESPN College Football app, like it’s predecessor, is loaded with content. Whatever team you follow whether it’s a national power or perennial conference also-ran, you are sure to find news and videos. In addition to that app features rankings, conference standings, the latest news, scores, and more. The GameCast feature is very well done. 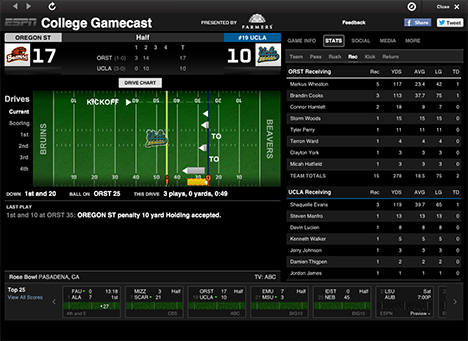 In addition to the graphical football field with drive and scoring information, it’s got all the stats you need, play-by-play and a social media component. 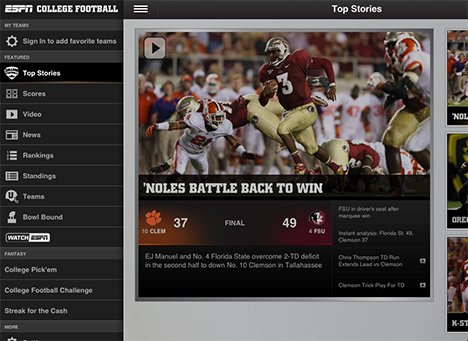 Some of the custom features, like the ability to set favorite teams and alerts require and ESPN account. Speaking of which, if you have the WatchESPN app and the proper TV subscriber credentials, you can load college football games from the app itself. I thought last year’s Bowl Bound app was generally pretty solid . This newly refreshed edition is pretty darn wonderful with just a few minor issues. For example, the scores and and time remaining don’t appear to be updated in real time on the main scoreboard sections. They do seem to update, but not as fast as you would expect. It can also load a little slowly at times. However, the amount of video clips, highlights, stats, and more make it a must have for the college football fan.